Manufactured prototype sample is checked by detailed measurements in working conditions at room temperature and in extended temperature range. Detailed test protocol is defined together with measurement environment design. The environment for measuring prototypes includes designing test board (PCB) for parallel measurement of several prototypes, then establishing communication and measurement control. It is accomplished through software developed for microcontroller. The integration of measurement control with test equipment is done by applying respective software. All above described allows the string of measurements and provides the detailed set of related results. It is also the bases for high quality documentation. Behavioural model, done in the first phase of design cycle, can be upgraded with given measurement results and used by potential customer to check the functionality of prototype in his/her own electronic system. Analysis of the measurement requirements. Development of the test protocol. 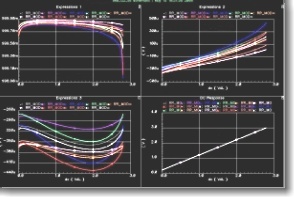 Development of the measurement software. Measurement system integration & measurements accomplishing. Interpretation and documentation of the mesurement results. Close cooperation with the Faculty of Electrical Engineering and Computing in Zagreb has been established in the field of developing and accomplishing chip measurements.